The Report window in QuickBooks 2013 provides five boxes: Dates, From, To, Columns, and Sort By. These boxes also enable you to control the information shown in the Report window and the appearance of the information. The Dates, From, and To boxes, for example, let you tell QuickBooks what reporting interval you want to show in the report. In other words, you use these boxes to tell QuickBooks for what month, quarter, year, or whatever period that you want the report prepared. The Columns drop-down list displays a set of column choices. 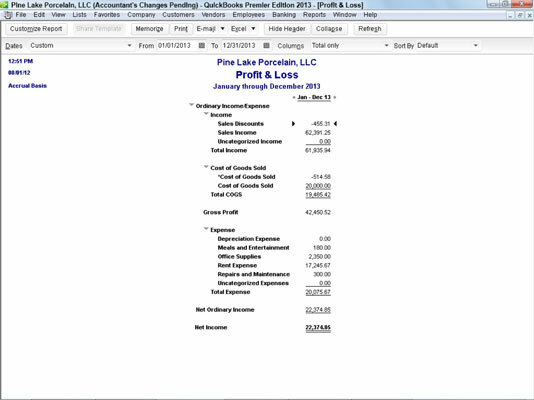 Initially, QuickBooks displays a single total column for a report. However, if you produce, for example, a report that summarizes annual income and expense data, you can use the Columns drop-down list to tell QuickBooks that you want to see monthly columns. In this situation, QuickBooks shows an annual income statement, but it also shows columns for January, February, March, and so forth. To see how this works, take a look at this figure. 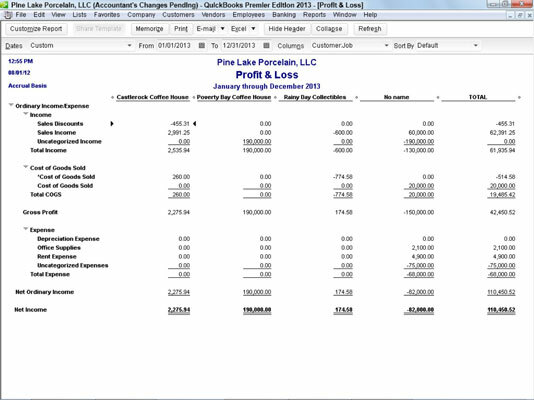 The profit and loss statement in the window is composed of only a Total column. Typically, some options make sense for the report that you’re working on; others won’t. Nevertheless, you should occasionally experiment with this tool. The Columns drop-down list often gives you a neat way to further segregate and refine your data. The Columns drop-down list gives you a bunch of different column options. Typically, some make sense for the report that you’re working on; others won’t. Nevertheless, you should occasionally experiment with this tool. The Columns box often gives you a neat way to further segregate and refine your data. The Sort By drop-down list enables you to choose how information should be ordered on a report. For many types of reports, the Sort By drop-down list doesn’t provide any meaningful options. For some types of reports, however, the Sort By drop-down list provides handy ways to organize report information.